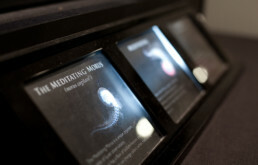 The Meditating Morus is an interactive installation, displaying imaginary creatures, who respond to being looked at by humans. The project was my master’s thesis project at NYU ITP . 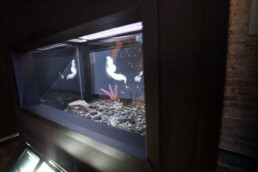 A continuing research from 2009 project ‘Axolotl’, ‘The Meditating Morus’ is an exploration of ways to present life-like behavior and motion, of animated organisms. Derived by the question of what makes us see an object as alive, and how can we reflect on the perception of life through this experience. I was curious to see what kind of response can be invoked in human observers of such experience. The exhibit is a physical installation, presenting the creatures in a three-dimensional space, resembling a nature museum diorama. I developed the project using Processing and open Frameworks in conjunction. 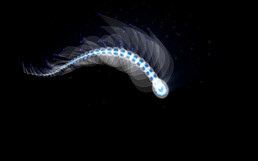 Using algorithmic design and motion allows for convincing, real-time and ever-changing nature of motion and behaviors, as well as interaction, among the creatures themselves, and also toward human visitors who observe them. The creatures may respond in different ways, according to traits that they possess, such as curiosity, playfulness, anxiety etc. The experience encourages quiet observation. The creatures are attracted to, and change their behavior when a human face is quietly looking at them. 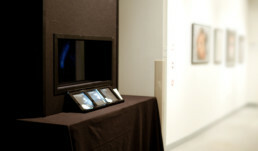 The Morus was displayed at a group exhibition, Geekdown 2010 in 92yTribeca gallery. It was interesting to see the different responses from visitors, especially kids who often thought that the creatures are real.